Beer Camp – the Best Way to Brew in Cottage Country! It’s 10am on a Saturday and a bunch of us are giddy with excitement as it is camp day. 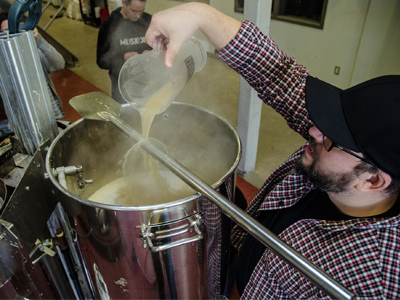 The smart folks at Sawdust City Brewing Co. have started up Brew Camp, an adult day camp for people who love beer! 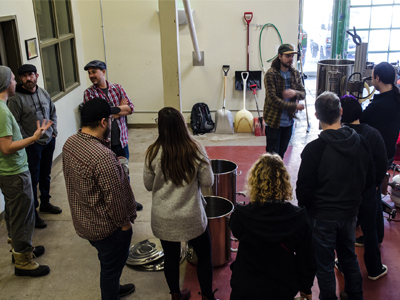 Our group of 10 is a fun mix of couples and solo beer geeks from the nearby Muskoka area and as far as Ottawa and Toronto. One thing most of us have in common is that we’ve never brewed our own beer, so we’re here to learn how the magic happens. Touring around the Sawdust City before we get going, we are quickly told we have free reign to do whatever we want! The brewery is ours…all ours! All-we-want beer labels and coasters and samples, we are like kids in a candy store. Of course, we are here to learn too. So the first step is for us to haul over the malt and oats we’re going to use for our beer. We’ve decided ahead of time, via a beer survey, that we are brewing a hazy IPA. Recipe-wise we are doing things a bit different, as we’re grabbing pilsner malt and carafoam, with a bit of flaked oats to help create the body we want in the beer. With help from Sawdust City brewer James, the exact measurements are determined, and we weigh things out before visiting Dennis the Hopper. Dennis is the mill that grinds down the malts and oat for us. We quickly learn that the brew team at Sawdust City has a quirky sense of humour! Incidentally, the pilsner malt tastes quite good, like something you’d pay big money for at a health food store. It’s apparently pretty common for the brewers to snack on it while brewing. As we get things brewing, carefully mixing in the malts with our water, we learn it is a three step process we are embarking on. First we are brewing at 65C to get a nice body, we don’t want it too hot to begin. This gets the sugars going. We’ll then bump up the temperature to 72C to sort some proteins, and finally a quick heat up to 78C to kill the enzymes. It all sounds somewhat technical, but James is leading the way for us so we can’t screw anything up too bad! At the various stages of our brewing and sparging process, James make sure we are whirlpooling the beer properly, monitoring the temperature to get things just right, and being careful with our vorlaufing. He seemed to enjoy having a group of beer oompa-loompas available to do what he commands. We all happily oblige. Now I had heard terms like mash tun, wort and sparging before without knowing what anything meant. It was pretty cool seeing the process in action, and being part of it. It was definitely an eye-opening experience to how fun, but also how precise and controlled, brewing can be. As the brewing process mentioned above takes a few hours, we take time in between to tour the rest of the brewery, enjoy some pints at lunch, and select the hops to be used in our beer. Scouring the basement of Sawdust City Brewery, we came out with magnum, mosaic, vic secret, galaxy, Idaho 7 and simcoe hops. After plenty of sniff tests we chose our hops, and set them aside. The basement of the brewery is where they store their barrel-aged beers. Some cool treats are coming from Sawdust City for those who are patient! A beer named Eagle’s Tears catches my eye. As we carefully do our sparge to get our liquid wort, we start talking about the name of our beer and what a label might look like. Thanks to branding man Jake, we quickly decide on an idea for him to put into action. We do not have to abide by all the rules and regulations of the LCBO, since we’ll be taking all this beer home ourselves! 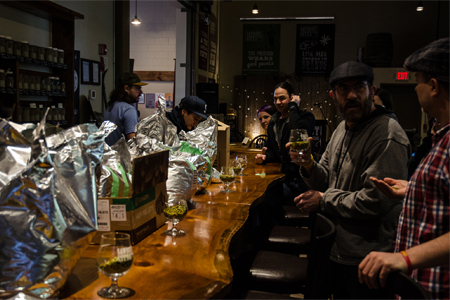 By the time we drop our magnum hop base into the beer boil, we’re all enjoying some nice pints of Sawdust City beer. The end is near! While the mash and sparging process took hours, this was a rather quick process. We add in our yeast and then our galaxy and mosaic hops went in for a quick five-minute boil and then we added in the simcoe at the very end. The different timing with the hops is done to impact different aspects of the beer, in particular the bitterness, and the aroma. 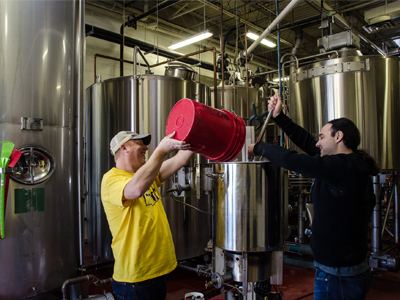 A mere 10 minutes later and we’re casting out our beer into a fermenter, and just like that, our job is done! Of course, the beer is not ready yet. It will take a few weeks to ferment, and James will add in some pineapple for us, to give our fruity, hazy IPA an extra kick. The team is allowed to return for bottling day, and then return again a couple of weeks later to pick up our finished, labeled product. For those who live further away, Sawdust City will also ship your beer to you anywhere in Ontario! It was a super fun day, from about 10am – 4pm, learning a lot about beer, hearing some fun stories about other breweries, and just hanging out with a cool group of beer geeks. If you know someone who loves beer, whether they are a homebrewer or not, keep an eye out for the next Sawdust City Beer Camp!